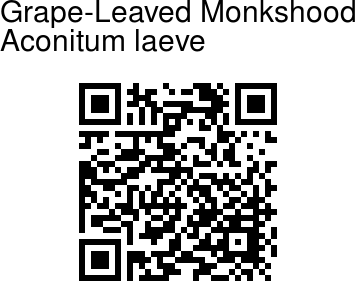 Grape-Leaved Monkshood is a perennial herb with elongate, cylindrical root. Stem is erect, up to 1.5 m tall, simple or with a few branches, in the upper part hairy and viscid, hairless below. Basal leaves have a very long stalk, usually withered at flowering time. Stem leaves are gradually decreasing in size towards the inflorescence, deeply 5-9-lobed with obovate to obovate-oblong segments, coarsely dentate or sometimes incised again, circular to kidney-shaped in outline, up to 30 cm wide, hairless, uppermost merging with floral leaves. Inflorescence is composed of branched racemes, up to 50 cm, with leafy tips. Bracteoles are linear to threadlike. Helmet from a wide base suddenly tapering to a cylindrical hood, straight or slightly recurved at apex, 1.2-1.6 cm high, 3.5 mm wide, yellowish. Petals (nectaries) with a narrowly conical straight gibbulose or recurved hood, 5 mm long, with deflexed, oblong, shortly bilobed lips. Filaments winged to the middle. Follicles are 3, 1-1.3 cm, spreading, hairless or with yellowish hairs. 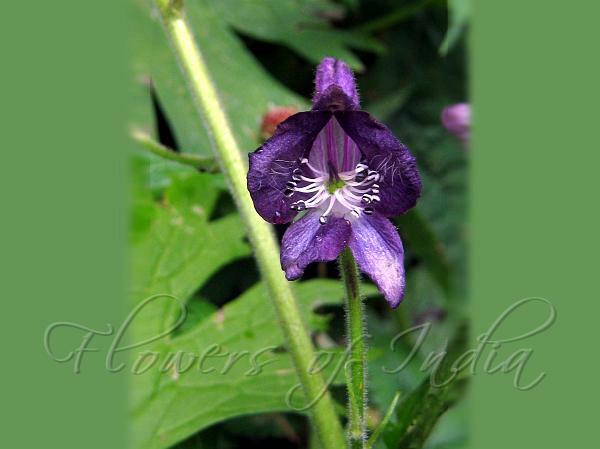 Grape-Leaved Monkshood is found in the Himalayas, from Kashmir to W. Nepal, at altitudes of 2900 m. Flowering: July-August.